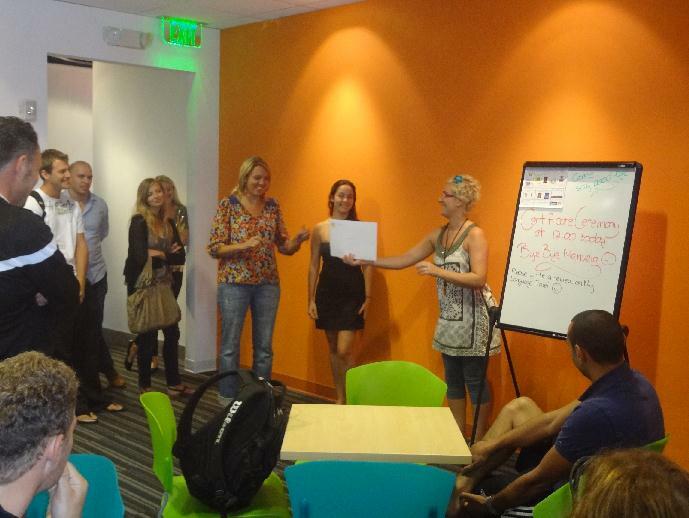 Last Friday, EC Miami said goodbye to our first student. It’s hard to believe that we are already having goodbyes when we have only just begun as a center! We had a small certificate ceremony for Manuella from Brazil who studied at EC Miami for three weeks. Nicoletta, our Academic Director, made a speech and presented Manuella with a certificate at the short event, which all of our students attended. Elisa, one of Manuella’s teachers, also made a remark about what a pleasure it was to have Manuella in class because of her unique sense of humor. An embarrassed, Manuella was coerced into making an impromptu speech, in which she thanked everyone at EC Miami. She will be missed from our small EC community on South Beach. We look forward to more graduations in the future, but we are sad that it is already time to start saying goodbye to more of our students. We look forward to welcoming more students in the future, but it is always difficult to see them depart!